Julieann Swanson, Assistant Curator of Digital Collections and Archives at the University of Minnesota’s College of Design just sent a fabulous photo of the Lake Street, Dean Parkway, and West Calhoun Parkway intersection from about 1956 in response to my post earlier today. See Julieann’s comments on that post for more information on this photo and the Digital Content Library. Julieann suggested that the photo is circa 1955, but I’ve advanced it a year to 1956, because I believe that is a red 1956 Chevy sitting at the east-bound stop light. And, yes, the traffic lights are quite visible in this photo! Would that car have been called, “Cherry”? I’m a little too young to remember ’50s slang. 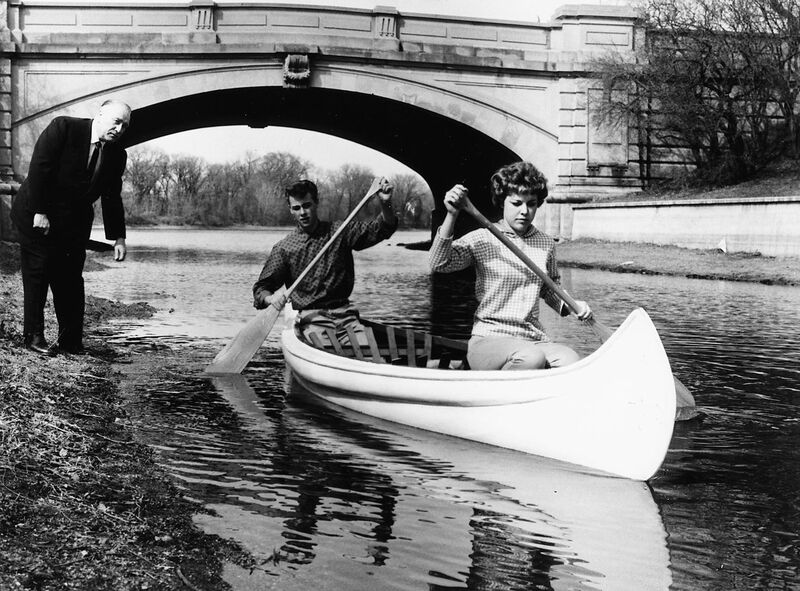 Two photos from the 1950s, and two that are much older, show how people got to Lake Calhoun once upon a time. 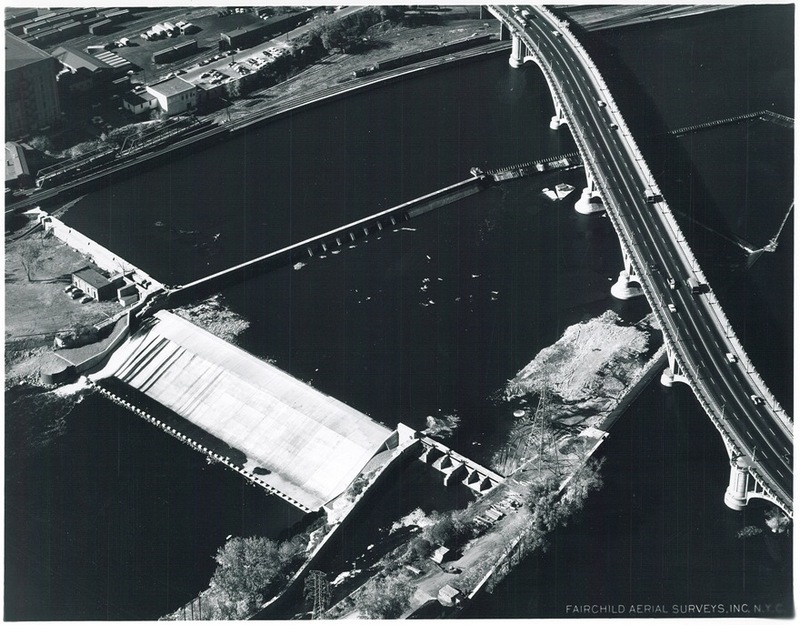 Both photos are from the Minnesota Historical Society’s online collection. I haven’t written about that collection in some time, but I continue to use it extensively for research on Minneapolis parks and other historical subjects. You should take a look if you haven’t before. It’s a treasure. 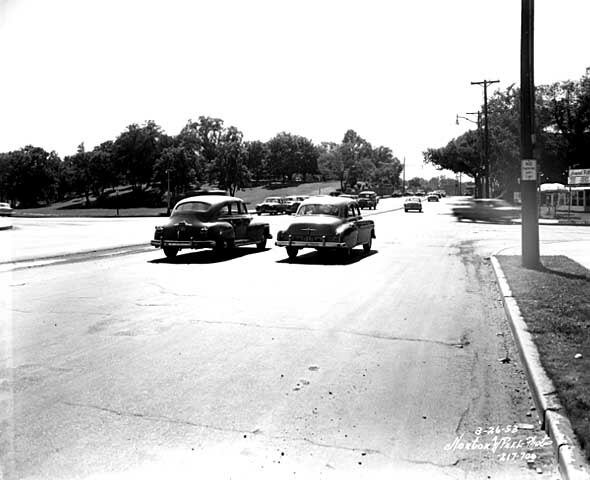 The first photo shows the intersection of Lake Street, Dean Parkway and West Calhoun Parkway, looking west. Many Minneapolis parkways were once called “boulevards”, but that changed in 1968 when the Minneapolis park board renamed nearly all of them “parkways.” The park board wanted to create uniformity in treatment, but also believed that by calling them parkways, people would better understand that they were owned by the park board and were part of the park system. I still refer to them as boulevards at times, out of habit, as do many others. Curiously, Google maps hedges, labelling the road around the west side of Lake Calhoun “W Calhoun Pkwy” and “Calhoun Blvd”. Note that the lot on the southwest corner of the intersection (upper left) is still undeveloped in 1953. The earliest photos I’ve found of the American Hardware Mutual Insurance Company building on the site are dated 1956, such as this aerial photo from the Minneapolis Star Journal Tribune. The park board never owned that piece of land, although it would have been a good addition to the lake park. The park board reported in 1916 that the purchase of 93 acres on that corner was pending, but the deal never was completed. 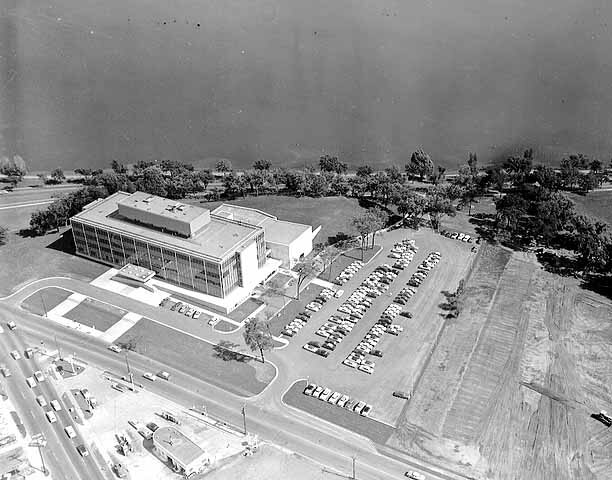 The land behind the building to the southwest was once a small bay of the lake, which the park board filled with material dredged from the lake bottom. Perhaps it’s simply an issue of the resolution of this photo, but I don’t see traffic lights even though it appears that east- and west-bound traffic is stopped. The lights must have been installed about this time, because the city engineer had developed an initial plan for lights at this increasingly busy intersection in 1951. 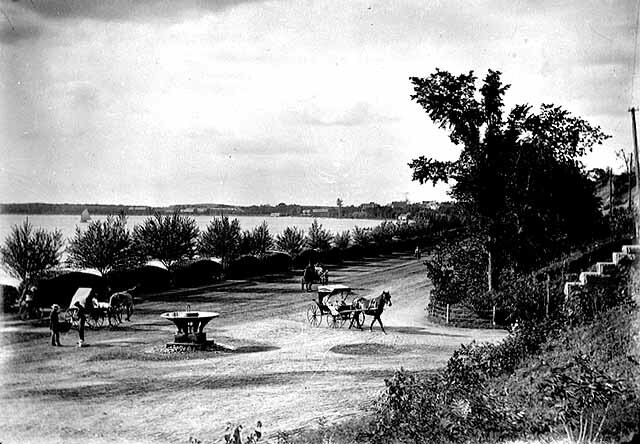 The photo below was taken at the opposite, or southeastern, corner of Lake Calhoun at about the same time. 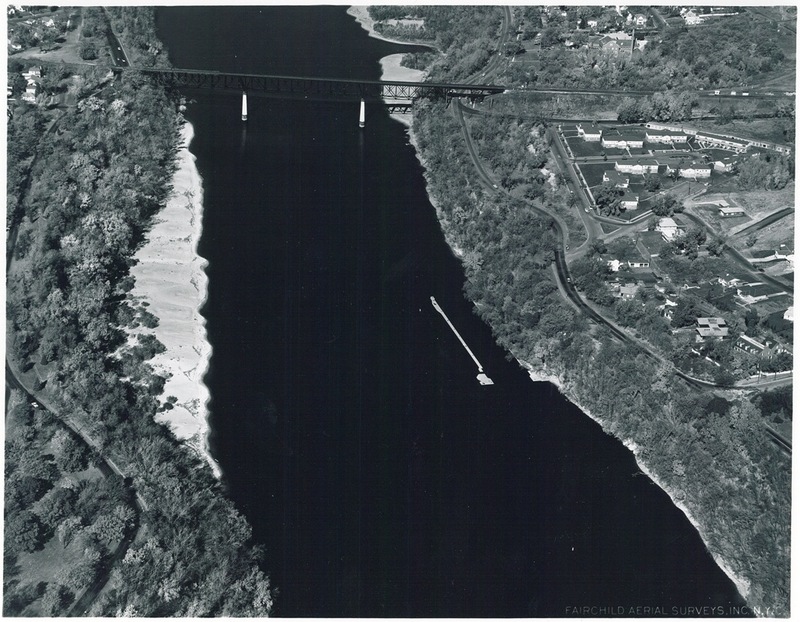 The photo is notable especially because the foundation of the street railway bridge over 36th Street still stands. This was the location of the rails that went to Lake Harriet and beyond to Excelsior and Lake Minnetonka. Of course, there were no traffic lights at the intersection of 36th and East Calhoun Parkway either. The trestle had been there since before the park board built the parkway. (See more on the Lyndale Railway Company at Lake Calhoun and Lake Harriet.) In the photo at right you can see the bridge foundation (far right), in front of the carriage turning east onto 36th Street. The fountain in the boulevard for watering horses was an interesting touch. So was the scalloped hedge between the parkway and the lake. Does anyone know when the street railway bridge supports were torn down? 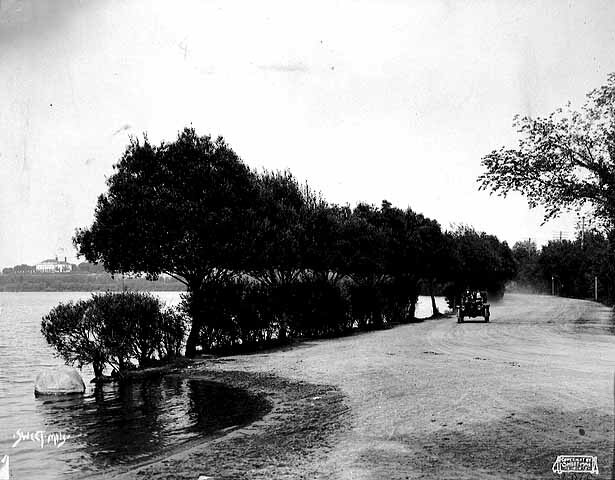 Most of the earliest parkways around lakes ran right along the water’s edge. 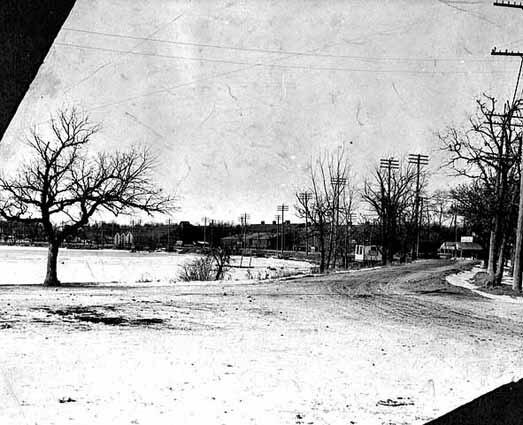 That feature of early parkways is more prominent in the photo below of the end of Calhoun Parkway in about 1905. At that time the parkway ended where it turned south to connect to Lake Harriet. The land behind the photographer in this photo was private land all the way around the west shore of the lake back to Lake Street and the top photo. 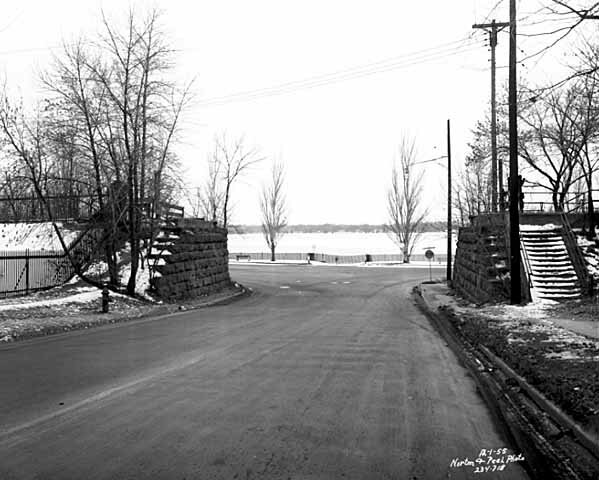 The photo below shows the approach to the north end of Lake Calhoun from about the same time period as the photo above. 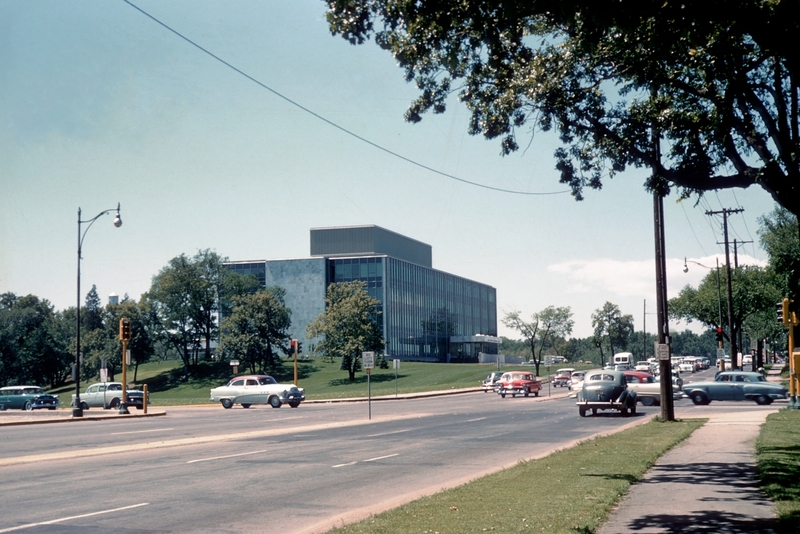 This photo shows Lake Street facing west at the northeast corner of Lake Calhoun. This was before the park board acquired the north shore of the lake. The only park land around the lake at this time was Calhoun Parkway beginning at the left of this photo and continuing to the previous photo. 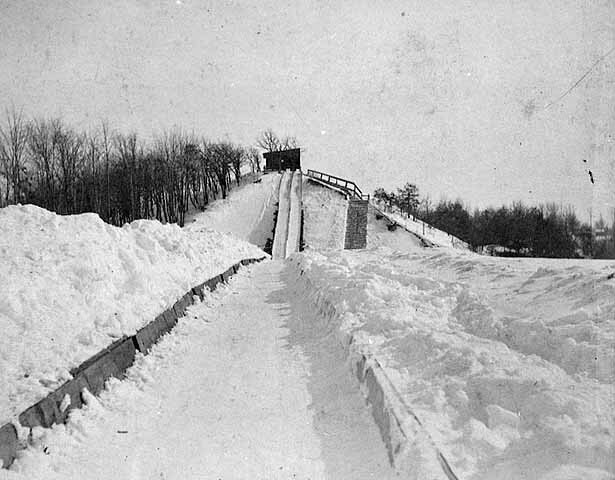 A couple of months ago I posted photos of a toboggan slide at Lake Harriet in 1914. Now I’ve rediscovered a description I had saved long ago of a toboggan slide from an earlier time on a Minneapolis lake. The Makwa Club—makwa is the Ojibwe word for “bear”—built a toboggan slide at Lake Calhoun in 1888, according to the Minneapolis Tribune, January 22, 1888. The other toboggan slides in the city that winter were maintained by the Flour City Toboggan and Snowshoe Club and the North Star Toboggan Club. (Newspapers of the time referred often to the toboggan “craze,” much like the bicycle craze that would soon follow, and the canoe craze that came after that. Today, I suppose, we text or tweet.) The Flour City slide was a 1,000-foot slide near Ridgewood Avenue that ended near Franklin and Lyndale. The North Star slide was west of the city in what is now Theodore Wirth Park. The Makwa slide was 220-feet long, running onto Lake Calhoun from the bluff on the east side of the lake where the Lyndale Hotel once stood. The slide had three chutes that had a drop of 55 feet and crossed both the street railway track—15 feet above the track—and Calhoun Parkway—24 feet above the road. (Yes, the Makwas did get the permission of the park board to build its slide over the parkway.) The slide met the lake ice about 50 feet out from the shore and the level runway continued 1,500 feet onto the lake. After a run of about 1/3 mile, toboggans hit roughed up lake ice that prevented them from running onto Lake Calhoun’s horse trotting track. The grandest feature of the slide, however, “had never before been tried in any slide,” according to the Tribune: a wooden warming house and starting platform at the top of the slide, 10 feet off the ground. The front of the warming room was made almost entirely of glass and looked straight down the slide. The slide was illuminated by five electric lights. The Makwas even had an arrangement with the motor (trolley) company by which the 7:40 train out from town every evening stopped at the foot of the slide to drop off club members and the 9:57 train made a special stop at the same place to pick them up for a return to the city after an evening of mirth. The slide was for the use of club members only. The Makwa uniform was breeches and blouse of heavy gray French wool and stockings, toque and sash of cardinal. The membership of the club was limited to 200 and included many of the best-known young men of Minneapolis. The president of the club in 1888 was English journalist Harry P. Robinson, who was featured in an earlier article about his close friend John S. Bradstreet. Bradstreet was a Makwa, as was park commissioner Eugene Wilson. The problem with the Makwa’s grand slide was that no one was willing to pay for it. In 1891, the Tribune reported that a lawsuit had been filed—in what it called the “Makwa mess”—by the man who built the slide in an attempt to recover his costs from the officers of the defunct club. Makwa Club members had been assessed $10 each to pay for the slide in 1888, but most didn’t pay. Some claimed that the officers of the club did not have the authority to spend the money on the slide. (I wonder if these claimants used the slide!) Of the $800 charged to build the slide, only about $300 had been paid. The Makwa directors, including Robinson, then sued individual members who hadn’t paid up. The Tribune reported on only two of those cases: one was not contested and the other lost on a technicality. By the fall of 1891, however, Makwa president Robinson had married the daughter of one of the wealthier men in Minneapolis, Thomas Lowry, so he may have found the means to pay the builder of the toboggan slide that was “much superior” to any other in Minneapolis. If you’ve ever seen a picture of the Makwa Club’s Lake Calhoun toboggan slide, please let us know. We’d love to see it.